We didn't get to work on the depth sounder and accumulation radars much, but we did get some nice photos our team putting them together and using them. The Depth Sounder radar is designed to bounce a signal off the bedrock that lies under 3000 meters of ice, so we can see what the ground under the ice sheet looks like. 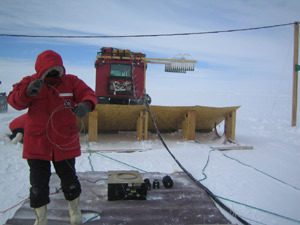 It also lets us measure the thickness of the ice. This is what the Depth Sounder sled looks like. It is made of plywood and plexiglass and the antennas are made of copper. Dr. Kanagaratnam is calibrating the depth sounder radar here. 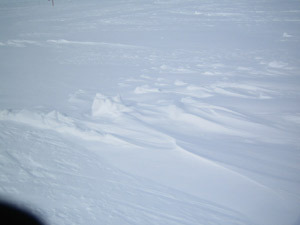 The wind is blowing so hard and the snow is blowing everywhere. This is very hard work because the cables get very stiff and hard to work with and the snow blows in your face and makes your hands very cold. You can see a movie of how hard the wind was blowing while the group was working. Once you get the radar sled with the antennas all set up, you have to connect it to the radar inside the vehicle. Joel Plummer is helping connect everything. The Accumulation Radar measures annual snow and ice layers down to about 100m with a 10cm resolution, meaning it is accurate to within 10cm. It lets us see deeper than the Plane Wave radar, but not as clearly. The antennas for this radar are mounted to plywood beams that are fastened to the top of our vehicle. You can see them in the left side of this picture. They sort of look like silver leaves. 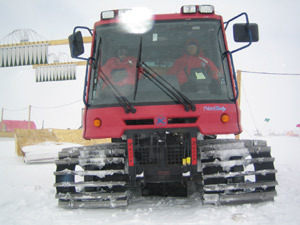 When the radar is taken out for a run, it is pulled along behind the Pisten Bully while the driver drives at a certain speed along a precisely designed course. The course is designed to help us make overlapping radar pictures. We call this course a "grid," but it really looks like a back and forth S pattern most of the time. 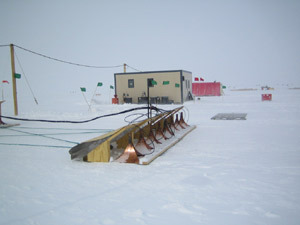 There are no roads on the ice sheet, so the driver uses a GPS to be sure he is going along the grid (or map) that the radar operator has specified. This is what the ice sheet looks like as he drives along. And here is a movie of the Pisten Bully pulling the radar sleds. 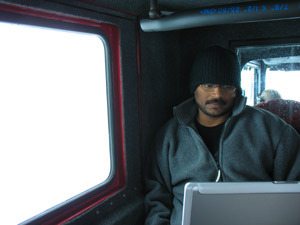 The radar operator (usually Dr. Kanagaratnam) sits in the back of the Pisten Bully while the radar is pulled along behind the Pisten Bully. His job is to watch the computer screen which gives him a readout of the GPS (where they are) and the radar data from the antennas. He makes sure the radars are working correctly and can give the driver instructions about moving faster or slower to get better pictures. If necessary, he can adjust the radar to make it more sensitive if necessary.